The degenerating relationship between McLaren team mates, Alonso and Hamilton, last year re-focused attention on the delicate business of balancing personal ambition with the needs of the team in F1. Many times the competition between Alonso and Hamilton was likened to that between Prost and Senna, also at McLaren, but that was actually a rather different circumstance. Ayrton and Alain became team mates at a time when they were recognized as the best drivers in F1; Fernando's problems emanated from the fact that his rookie team mate proved far quicker than anyone had expected. Looking back through history, there are plenty of examples of team mate relationships turning sour. Perhaps the most famous is the breakdown between Gilles Villeneuve and Didier Pironi at the San Marino GP of 1982 but there were others that lasted longer and were just as acrimonious. The closest parallel to the Alonso/Hamilton feud happened in 1981 between Williams team mates, Alan Jones and Carlos Reutemann. Jones was a tough, uncompromising Australian who had served his apprenticeship in F1 with a series of lesser teams, actually scoring a win for Shadow in the Austrian GP of 1977. The talent was there but it seemed that none of the top teams were interested. Even his move to Williams in 1978 seemed inauspicious - this was before the team were to become one of the best. 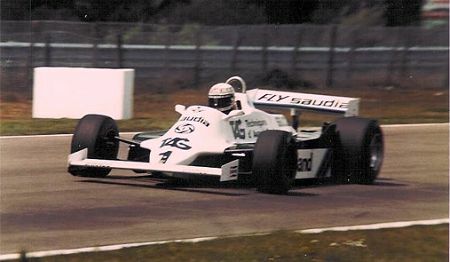 Towards the end of 1979, Williams introduced the car that was to conquer the world, the FW07. Jones won four races at the end of the season and was catapulted into the position of favorite for the following year. At the same time, Williams acquired the services of Carlos Reutemann, another respected driver who had led Ferrari's challenge and finished third in the Lotus 79's all-conquering year, 1978. In spite of a long career in F1, the Argentinian remained somewhat enigmatic, on occasion brilliant but apparently uninterested at other times. The feeling remained that, if he could just get his head right, he was a potential champion. It looked a strong driving team and, in 1980, it duly delivered, Jones winning the championship from Nelson Piquet while Reutemann was third, so guaranteeing Williams of the constructor's crown. In 1981, however, tensions surfaced. Reutemann seems to have been of the opinion that it was his turn to be champion, having assisted the Australian to the title the previous year. Jones did not see things in quite the same light, being as hungry for race wins as ever. The FW07 was still the car to beat as the season commenced and Jones won the first race, the USGP West in Long Beach. In the next race, the Brazilian GP, however, Reutemann disobeyed team orders and took the victory. Jones was furious and vowed to gain the championship without the help of his team mate. The season developed into a battle between the two, culminating in a Las Vegas race in which Piquet did just enough to beat both of them to the title. The battle between the Williams team mates had been so bitter that it soured both drivers' attitudes to F1. Jones retired at the end of the year, perhaps prematurely, for he returned briefly in 1983 and then had another stint from 1985-86. Reutemann stayed on for the '82 season but then abruptly retired after two races and never returned to the sport. Although there are differences from the Alonso/Hamilton confrontation, the causes were similar. Jones/Reutemann was essentially an argument over status within the team, one feeling that his time had come, the other certain that he should be number one. With Alonso and Hamilton there was that same reluctance within the team to prefer one driver over another; and so one was left feeling that his established talents were not being recognized while the other felt that he had a right to equal treatment regardless of how new to the game he was. It does put a big question mark over the policy of not having an established lead driver within a team. All drivers are highly competitive and will take whatever advantage they can get in the battle to win races and be champion. And, when abilities are about equal, a clash becomes almost inevitable. That's true, Architrion - the battle between Piquet and Mansell was fierce indeed (also at Williams - interesting!). There is even the psychological element in that Nelson used to enjoy winding Nigel up - just as Hamilton and Alonso dropped hints to the press at times. I think, if I were a team manager, I would look for an ideal number two driver first, someone who was nearing the end of his career with nothing left to prove, and only then go in search of a potential champion! I suppose it depends what you're aiming for as a team owner. If you want the constructor's prize, get two star drivers, let them fight, and you should get enough team points to win. Of course, you will probably end up with two very disgruntled drivers at the end of the year but perhaps that doesn't matter to some team owners. To my way of thinking, the driver's championship has a much higher profile than the constructor's and so that's what I'd go for. If the best points are always scored by your number one driver, he'll probably be champion and it will be remembered that he was in one of your cars. Who remembers which team won the constructor's each year? I have always like the McLaren/Williams approach of getting the best two drivers they can and letting the drivers sort it out on track. It can backfire though as Clive suggested. In 1986 the Williams was the car to have but Mansell and Piquet took a lot of points from each other and Prost who dominated his team mate Rosberg who was in his final season stepped up to take the championship. Williams uniquely have always said the the constrictors championship means more to them than the drivers championship. I´m with Steven on this matter. I´d like to look the teams as live organisms and the best driver might naturally suit this organism to receive his supply: a fast car and a spiritual support. Ok, this is a kind of Darwinian view: all organisms, even the ones of the same species (drivers at the same team), fighting for space and food on the same territory. Could be a furious and a self destructive fights some times (as McLaren in 2007), but this is what moves the guys and all the team forward and most important, provide us a great show. In fact, this is the core of the business, drivers fighting each other, isn’t it? Did you ever heard, Clive, that some species of sharks fight for his life already inside the uterus? Guess who is the one that will survive? I'm with Steven as well. In fact I would go so far as to say when a top team doesn't put the best two drivers it can get into its car it brings F1 into disrepute. I guess it's all in how you define the word "best". In 1981 Williams took it to mean the fastest and ended up with two guys who did nothing but damage to each other's hopes, effectively giving Piquet the chance to step in and win the championship at the last. Very much the same happened to McLaren in 2007, although the team's choice of team mate for Alonso turned out to be a whole lot better than they expected! My point is that a good second driver, one who is quick enough to harvest points and win when the leader doesn't, is the "best" from a team point of view. It is hardly bringing F1 into disrepute when your driver strategy is designed to win both championships - and, looking at history, choosing the fastest drivers is not necessarily the "best" way to do that. I also think a team should hire the best drivers it can and let them go at it. That said, if a team is primarily interested in winning the constructor's title, well then Clive's thinking would be the best approach. But in my mind, F1 is pinnacle of motor sports, and every driver should be fighting for a win every time. I think all drivers, even those who are reaching the end of their careers, are hoping for a win in each race. But there is only one winner per race and drivers have to be realistic about their chances too. So most of the field will start a race knowing that, unless a miracle happens, they aren't going to win this one - and their task becomes to drag uncompetitive machinery as high up the order as it will go. And it is in this area that older heads score; those who can stay out of trouble, think ahead and drive consistently through the race will finish better than the hothead who tries to win at the first corner. And these, the Patreses and Coulthards of the F1 world, are well worth their pay. Number twos they may be but they are important to the team and to the number one driver. Ideally, a team principal should have two drivers who are flexible enough to accept being team leader, team support or being equal with their team-mate as the situation demanded, is compatible with the ways the team goes about racing, but is still fast, consistent, technically-minded and all the other attributes required to be a good F1 driver. However, the requirements for a driver to get into F1 in the first place tend to militate against a team principal finding one driver who fits that description, let alone two. Hence the problem with finding team-mates compatible with the team and each other. The best compromise would be for a team principal to pick one driver as a pivot point (if neither of the current drivers are staying on for the following year, then the best driver that can be secured in a timely manner) and then deciding who will be the other driver according to the strengths and weaknesses of the driver already signed. However, McLaren did this and still failed. Why? Because there were things they did not know about both Alonso and Hamilton that had a serious effect on their suitability to be in the same team (and in Alonso's case, his suitability to be at McLaren at all). At the time, McLaren did not know how sensitive Fernando was to being defeated by a team-mate under any circumstances, nor did they know that he's quite picky about how his team relates to him (and that he requires a warmer, more self-orientated connection to his team). McLaren also didn't know that Lewis was such a fast learner, or so prone to putting his foot in it when it came to the press. I'm still not convinced that the Alonso-Hamilton pairing failed because they could not be team-mates to each other. Rather, it was because Alonso was not suited to the McLaren way of doing things and Hamilton made things worse by what he said to the press at times. Still, it is an intriuging example of how even the best-laid driver pairing plans can go wrong. A wonderful quote from Alan Jones in those acrimonious days at Williams; when asked if he considered Reutemann to be a team-mate or rival, Jones replied, 'neither'.